Do you want to use normal 230V / 110V AC devices from the power supply of your car or weekend house? In this case, I can offer you a choice of alternators. 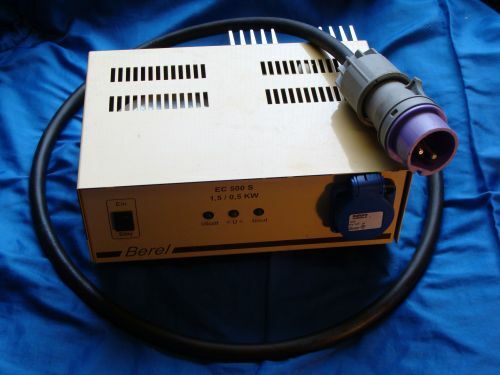 Especially for farmers and truckdrivers it can be very useful to connect power tools to the power supply of the truck or tractor. With the correct alternator it's no problem to get a power from over 1000 W to connect almost every power tool and you don't need noisy gasoline engines with their exhaust fumes. As more and more electrical devices are used, the dependence of the mains supply is getting bigger and bigger. You can see this, if there is a larger blackout for a longer time like it happened some years ago in the northwestern part of Germany. The heating system does not work anymore, cows connot be milked and shops can't open ... . You can avoid all this with a well dimensioned backup power supply. In most cases, a big, well loaded accumulator is enough to supply the necessary devices over an alternator. In every case a good consulting is necessary to get the backup power system well dimensioned. For this reason, you can make an appointment with me.